It all begins with a tree. The family’s orchard is made up of Sugar Maple (Acer saccharum) trees with a few White Maples (Acer saccharinum). Sap harvesting begins in late winter and early spring, when nights are cold and during the day the temperature rises. At night, the sap freezes and then during the day it thaws in the warm weather and allows the sap to “run”. A small hole is drilled into the tree and a spout is inserted to catch the sap that leaks out during the day. Sap is then pulled to the sugar house and boiled. When boiled, the water in the sap evaporates and what is left is the golden syrup we love! Multiple lines crisscross through the orchard, smaller individual tree lines feed into larger ones. The sap is vacuumed from the orchard into the sugar house. It then heads into the large boiler, heated completely by firewood. Boiling is a short season, only a few months, and when not boiling the family is harvesting wood for the fire and tending to the orchard. The fire is kept at a steady 1500 degrees. The syrup flows through the boiler, allowing the water to boil off and form the steam you see in most of these pictures. Once the syrup reaches the proper temp of 219.6 degrees, it is ready to be filtered and enjoyed! The hot syrup is then filtered through a press and ready for bottling. To grade the syrup, it’s color is looked at and compared by the standard. It takes up to 43 gallons of sap to make one gallon of syrup!! 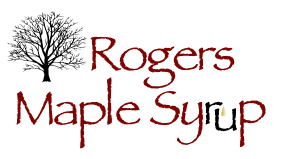 Rogers Maple Syrup Farm also makes maple candies and maple cream. Grade A Light: Light in color and flavor. Sometimes called “Fancy” syrup. Great table syrup. Limited availability. Grade A Medium: More amber in color and richer in flavor. Perfect table syrup. Grade A Dark: Most popular. Darker with a stronger maple flavor. Another perfect table syrup. Also great for cooking. Grade B: The darkest and strongest maple flavor. Can be a table syrup. Usually used for cooking.